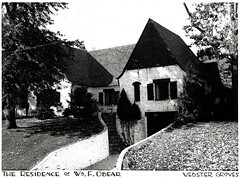 One of Armstrong's earliest complete homes (after his own home of 1926). The house features white-painted brick with wood framing and siding above. The lintels over openings in the brick wall are heavy timber beams exposed. The house is organized around a courtyard located at the front of the house. Two undulating white-painted retaining walls open a slot in the ground for cars to enter the garage at the lowest level and a curving brick stair leading up to the courtyard which overlooks the street. The high peaked roof, gentle easing of the eaves, and lack of overhangs is typical of this period of his work. where the roof meets the brick masonry supporting wall below, bricks are set in a corbelled manner giving the appearance of dentils. The gable end walls are brick masonry up most of their height. Where they terminate, a set of wood purlins are exposed and horizontal wood siding, stained dark, fill the remainder of the gable end walls. This form corresponds to many of Armstrong's works of this period such as the Monday Club and the first Armstrong Residence, both of which are not far from this home. Valley Road is a short, one block long street that splits a block located between South Maple and Plant Avenue. The street is quite narrow and appears to have been originally developed without being constructed according to the City standards (sidewalks, curbs, pavement, etc. ).